Meet JÖRD Apron. A custom-designed line of protective wear made specifically adapted to your needs. Welcome to the one tool you’re no longer missing. Cooks, servers, painters, mixologists, baristas, florists, gardeners, DIYERS, woodworkers, barber, chefs, tattoo artists & butchers ... we saw how great the need was. JÖRD was born. No matter your lifestyle, your trade, you are familiar with the search for the perfect tool. The one that feels like an extension of yourself; the one that fits perfectly, moves with you, never gets in your way and maintains the style you’ve worked hard to create. 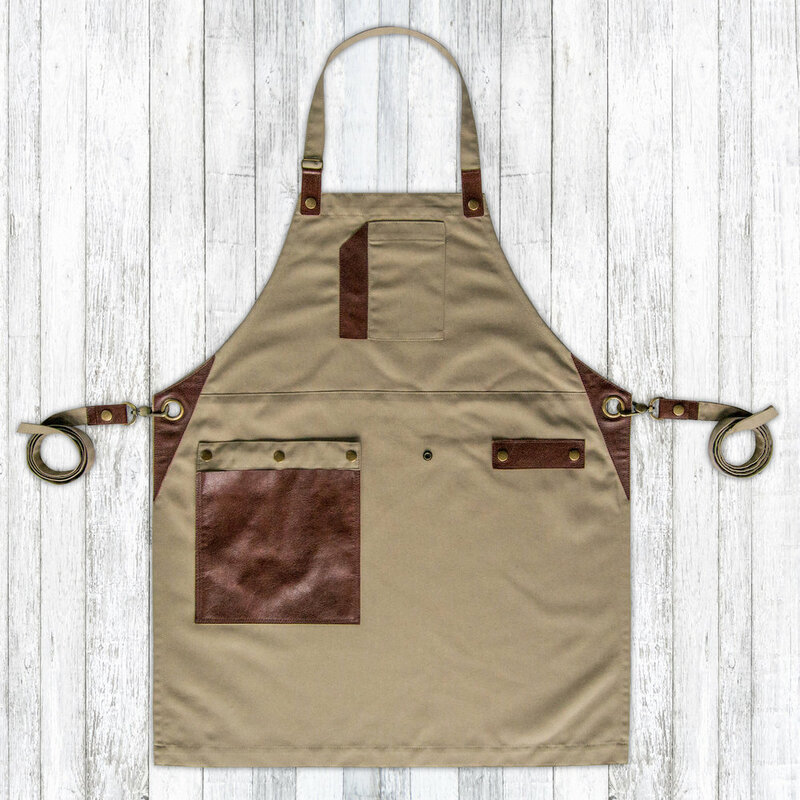 "Designed to make your life easier in the kitchen"
JÖRD aprons are perfectly handcrafted using only high-quality materials. A meticulous attention is given on the detail, design and accessories to provide a standout style combined with a flawless fit. Our purpose is to create something unique, flattering and functional. 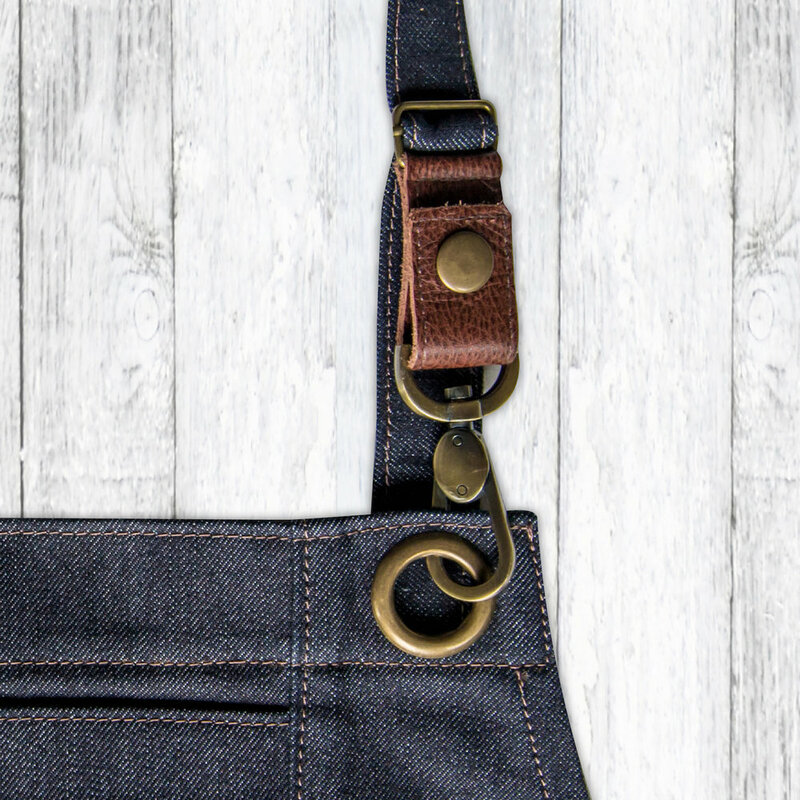 All the aprons come with adjustable straps, so you can make them fit better to your size. 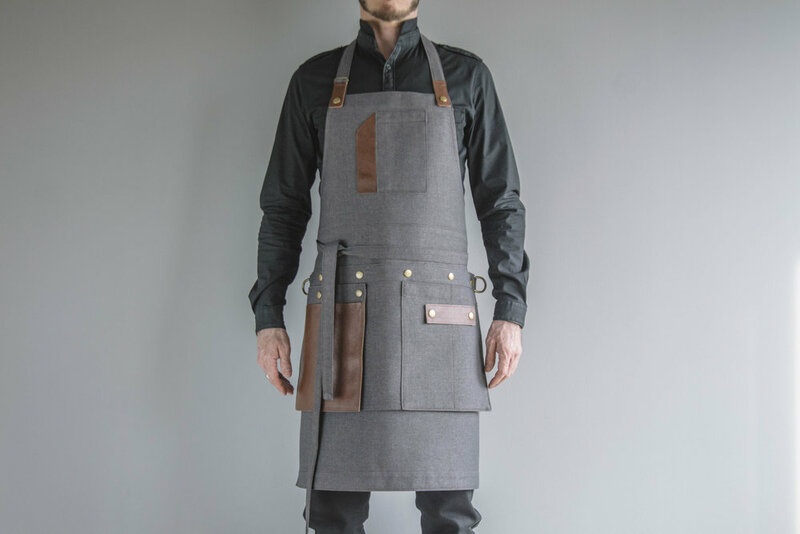 Our [ 5 in 1 A Model ] Customizable Apron with removable pockets that can be worn separately, or left or right with leather ring and removable leather pocket for left or right handed. 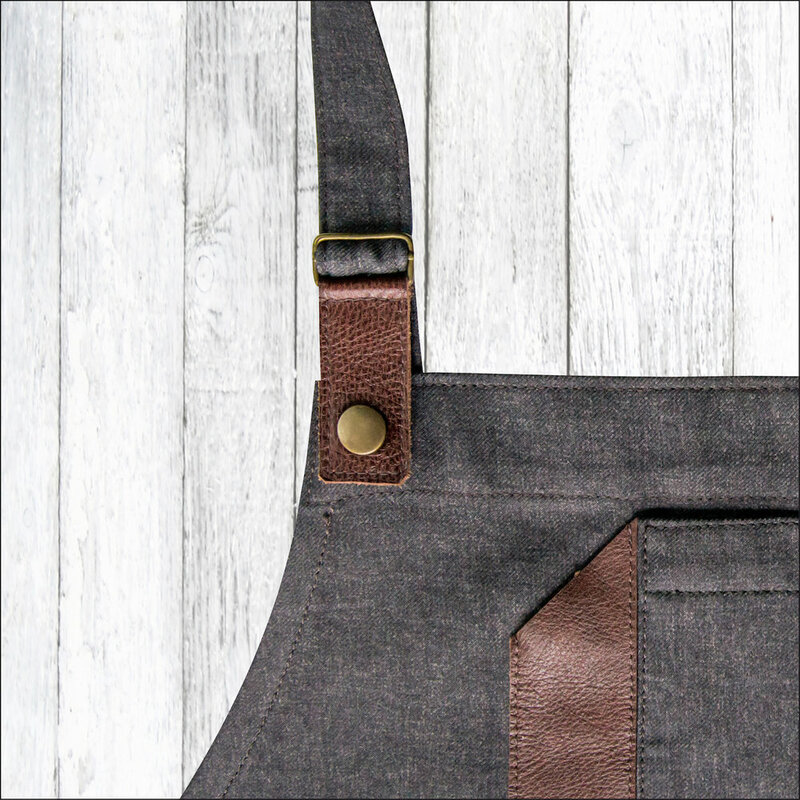 The body of our aprons is composed of two parts that are put together by a seam on the waist. This seam avoids the balloon effect around the waist that most other aprons in the market have. 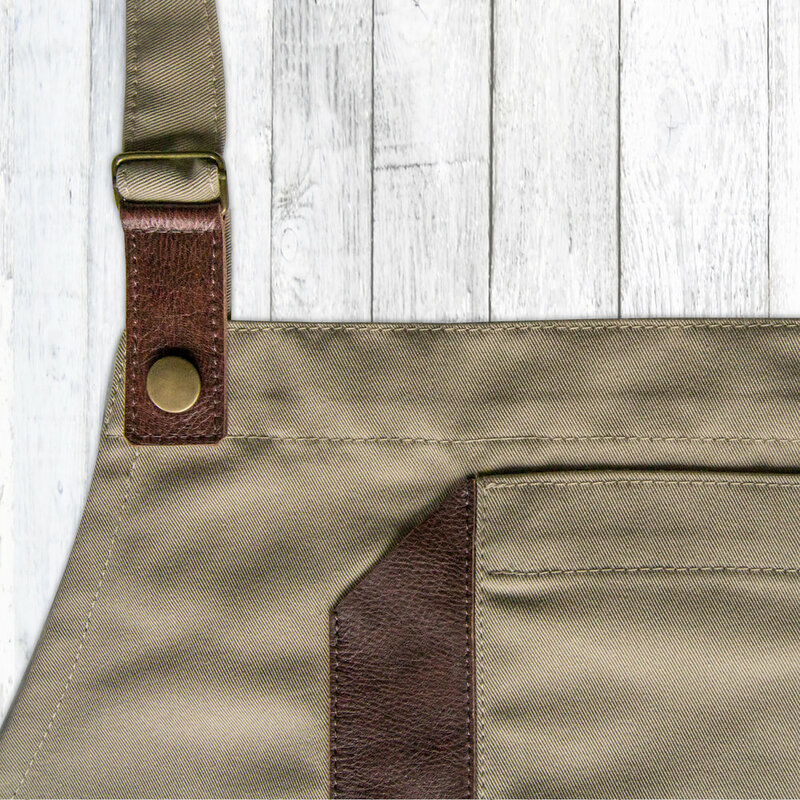 All the aprons are 100% hand made with 80% cotton and 20% polyester [250 G/M2] strong twill fabrics, developed for the JÖRD collection. The powerful ULTRAPEL protection is a dual action patented that repels water and stains, while leaving the fabrics feeling and staying, breathing and comfortable. Stain-repellent textiles are not a new concept. What JÖRD does differently, is apply the technology to woven fabrics and make them more resistant and Foolproof. The technology is based on a finish which protects the fabric from staining. This is achieved by blocking the stain and preventing it from penetrating into the fabric. The process forms a coating on the individual fibers within the fabric and thus protects it from spills, stains, whether oil or water based, wet or dry - even tougher stains like blood or oil. The colors have been specially developed for the JÖRD collection and our fabrics are environmentally friendly. Quality is our highest goal, that's why our leather is from finest collection and specially selected for the details for our aprons. 26" wide by 32" tall, with the upper part around 12" tall and the lower 20" tall and the width of the neck is 10 ". Plus, the waist apron with removable pockets that can be worn separately, are 11.5” wide by 21” tall. 26" wide by 32" tall, with the upper part around 12" tall and the lower 20" tall and the width of the neck is 10 ". Our JÖRD AT WORK: Are around 30" wide by 36" tall, being the upper part around 13" tall and the lower 23" tall and the width of the neck is 10"
Machine wash, it’s totally safe. Wash with warm water delicate cycle, dry flat [no bleach and without liquid softener]. These aprons are coated so they will repel water, liquids and most food stuff, turn the apron inside out and iron. They are super easy to clean!